I spent a handful of years in my early twenties as a vegetarian (blame it on a half decade of living on a pig farm) and exploring vegetarian cooking. Although I did find my way back to the omnivorous table, I didn’t lose my love for plant food. I eat vegetarian most days, falling back into old habits of smearing avocado on everything, roasting vegetables, and playing around with spices. 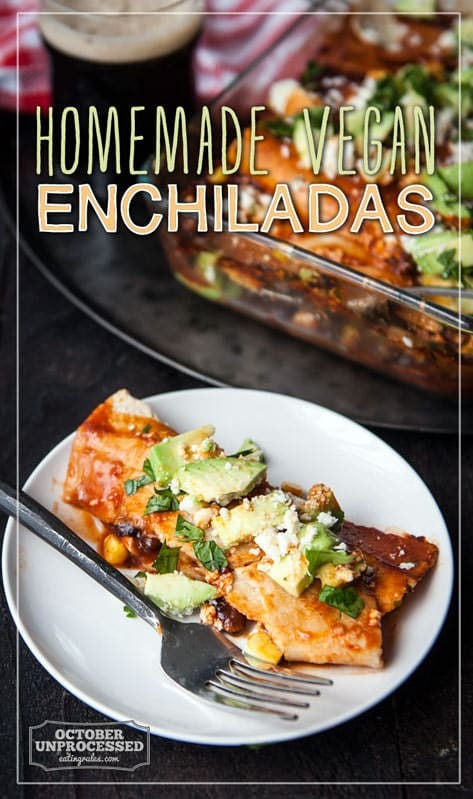 Enchiladas were a staple in my house as a kid (although, what my mom made was more “burrito casserole,” but still!) and I still find it to be such comfort food. It’s easy to create this dish as a celebration of produce and make it your own. Fill the tortillas with your favorite vegetables, roasted or fresh, top it with more. Use cheese if that’s your thing, or just satisfy your need for something creamy with lots of mashed avocado. The sauce is simple and can be made in advance. To be honest, it probably should, the flavors are better the next day. If you’re into canning, this makes an excellent canning subject. Maybe even a good housewarming gift along with a big pile of homemade tortillas and a few avocados. Although, I’d have a hard time giving away a basket like that, I might just end up keeping it for myself and showing up to the party with a few bottles of beer and a guilty smile. 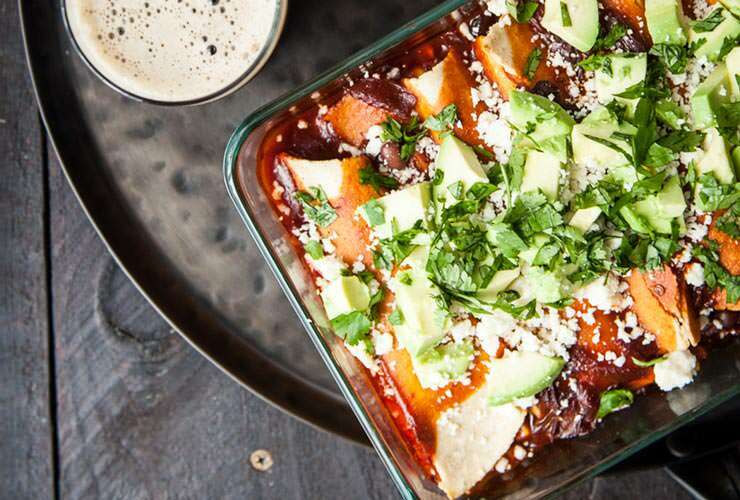 Homemade sauce sets this vegan enchilada recipe apart from the rest. Make the sauce ahead of time for easy weeknight assembly. Quarter the tomatoes and add to a baking sheet, drizzle with two tablespoons olive oil. Bake for 20 minutes, or until the skin is shriveled and starting to pull away. Remove from oven, allow to cool enough to handle. Heat reamining 1 tablespoon olive oil in a pot over medium high heat. Add the flour, whisking until well combined with oil and cooked slightly. Stir in the spices until they become fragrant, about 30 seconds. Add the stock, simmer until thickened, about 5 minutes. Add to the food processor with the tomoatoes, blend until smooth. Store in an airtight container in the fridge until ready to use, can be made up to one week in advance. In a small bowl, mash together two of the avocados (reserve the third for the top), salt and papper. Heat the tortillas slightly to make them more pliable. One at a time, spread tortillas with avocado, fill with black beans and corn, roll tightly. Place into a 9x13 pan in a tight row. Pour the sauce evenly over the pan. Bake at 425 degrees F for 12-15 minutes, or until warm and bubbly. Top with remaining diced avocado, crumbled cashew cheese (or cotija), and cilantro. Serve warm. Here's how to make tortillas from scratch and how to make vegan cashew cheese. Yum! These look fantastic. Definitely going to give them a shot! Feel free to omit it, it’s great without it!